When asked to decorate a beach house or summer cottage, I immediately think of white slip covers, sea glass tones and pulling from nature for my design. I like to work with a color palette that reflects the sand and sea, starting with white and neutral tones and using accent items, like end tables, mirrors and throw pillows to add color to the room. I bring nature into the space in a purposeful way, using items like driftwood, coral and capiz shells to bring the outdoors in. I love to use side tables that have beautiful lines and colors like the Dijon Side table from Guildmaster or the Artifacts Architectural Accent table. Both are great choices for a summer house setting. The Oly Meri Side table is another great choice because of its coral-like texture. Placing items from nature, including green plants, on tables adds another level of interest and pulls the design together. Lighting and mirrors are also fun to play with in beach house design. 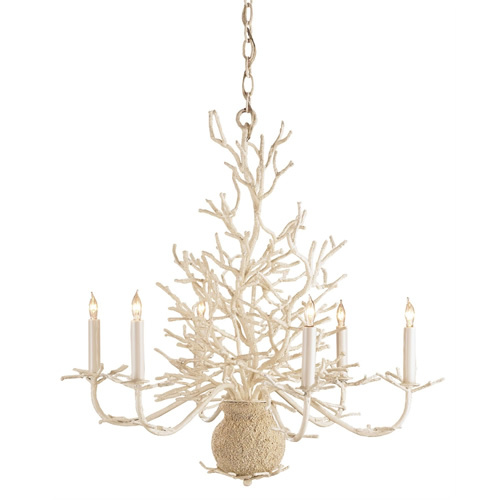 The Currey & Company Seaward chandelier is spectacular, a true focal point for a room. The Oly Capese Shell chandelier is gorgeous as well, and is versatile enough to work in a traditional or contemporary space. The Currey & Company Blue Point Mother of Pearl mirror is ultra-elegant, yet completely at home in a beach house. The Corail Wall mirror is super cute with great colors and coral-inspired design. Bedrooms should be an oasis at a vacation home. I love working with crisp linens that are both elegant and comfortable. Pine Cone Hill’s Ruched linens are an excellent choice for the master bedroom. They have gorgeous edges and details on neutral tones. The Peacock Alley Scalloped bedding is also a good choice because of its beautiful, crisp look. Accent pillows can be added to the bed, sofas or chairs anywhere in the home to add interest and fun. I love the Lacefield Peacock and Oyster linen pillow, with its layered look and great colors. I also enjoy using pillows with sea inspired designs like the Lacefield Lava Seahourse pillow or the Sea Star Turquoise pillow. 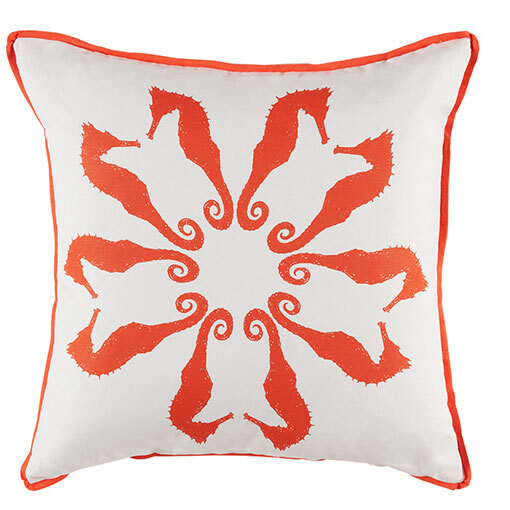 Accent pillows are an easy way to freshen the space and add interest to neutral linens or slipcovers. Whether you are remodeling your summer home or just “freshening up” for the season, be sure to pull from nature and design with the items that inspire you.